A rivalry isn't really a rivalry until the rivals trade off wins over the other. 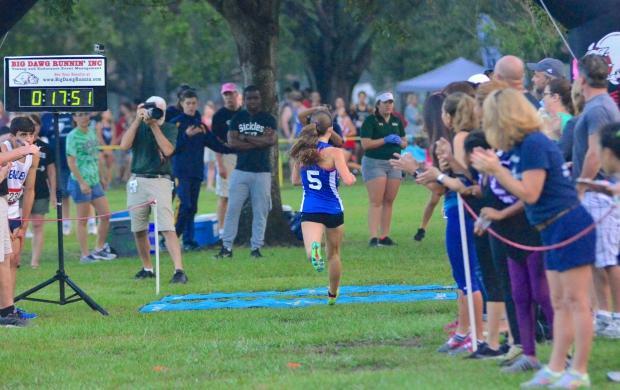 The story in girls cross country in Tampa this year has been Newsome and recent Indiana-commit Bailey Hertenstein versus former teammate and Riverview sophomore Alyssa Hendrix. Hendrix is a fierce competitor and won the North Port Invitational but she has played second fiddle to Hurricane Hertenstein in head-to-head match-ups, nipping at her heels but never quite beating her. 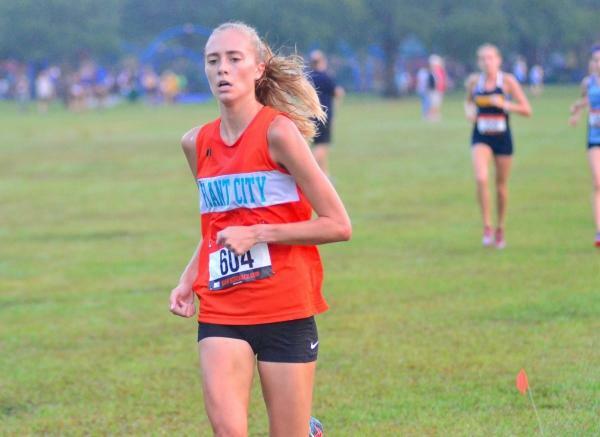 With side stitches biting at Hertenstein, Hendrix seized the moment and topped her for the overall girls individual title at Al Lopez Park in Tampa. Now, it's a rivalry. The course at Al Lopez had a bad reputation for coming up short of a 5k but also has a reputation for being one of the faster courses in the region. The course was re-configured by host Steinbrenner for Monday's meet. It now takes three loops around the park, instead of two and cuts out all pavement. The consensus among coaches and the times bore evidence that it measures out to be a 5k this year. That evidence magnifies the superb morning that Hendrix had. Characteristically, Hertenstein got out to the early lead. Coming back through the starting area, near the one-mile mark, Hertenstein had a couple strides on Hendrix. Then a ten-second gap opened up where Steinbrenner's Alexandra Straumann pulled into third. A few seconds behind Strauman, a pack led by Newsome's Emma Solis and Keleigh Scallon trailed. Plant City's Cassie Highsmith nestled in behind Solis and Scallion. The side stitch on Hertenstein was already visually and audibly affecting her as she extended her lead, just slightly, over Hendrix going into the second lap. The two-mile mark was within 20 yards of the one-mile mark but on the second lap. By then, Hertenstein and Hendrix were stride-for-stride. The pain in Hertenstein's side was really eating away at her by that point and Hendrix pounced at the opportunity. "Just before the second mile, I could tell she (Hertenstein) was slowing down," Hendrix said. "I thought she was out to a sub-18 minute race at the start. Then I pulled basically side-by-side with her at two miles, then around a curve I passed her." Passing Hertenstein is a Herculean task even on an off day. Around that same turn near two miles, Citrus Park Christian's Lydia Friedman and Jacqueline Abanses moved up into third and fourth, respectively, with Highsmith in fifth. Scallon and Strauman battled for sixth. Coming out of the wooded area for the third time and down a grass straightaway for the finish, it was Hendrix in control, having cranked up her pace even more to finish in 17:51.5. Hertenstein took second at 18:23. 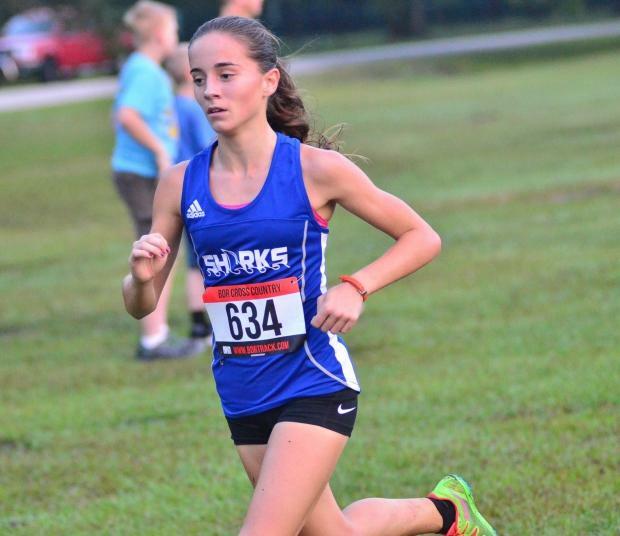 The time knocks down Hendrix's 18:03 from North Port as well as both the course and meet record for Al Lopez Park and the Hillsborough County meet. "The side stitch was really hurting and I tried to slow my breathing even pushed on it," Hertenstein said. "She (Hendrix) is really good, she got what she deserved today." It's important to note that Hertenstein ran a 17:30 at the 2016 county meet but that time was eventually bumped down to a three-mile time. 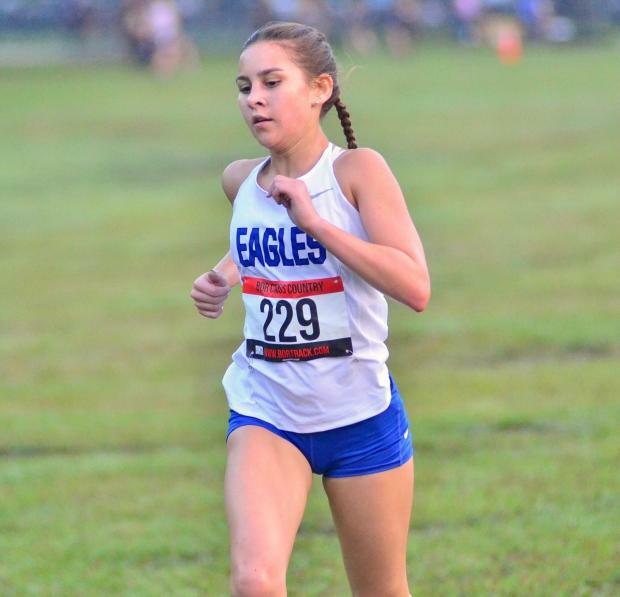 Still, it does little to diminish Hendrix's performance on Monday, setting down a 2006 meet record previously held by Amanda Quick of Gaither (18:18.13) and a 2008 course record from Brigithe Moreno of Plant (17:59). The battles continued. Friedman fought on for third in 19:05.1. Highsmith held steady to take fourth in 19:12.1 for a PR. "I hadn't raced on the new course layout, this was the first time it was all grass," Highsmith said. Highsmith took advantage, setting down her PR just from the FSU Pre-State meeet (19:34). Friedman's teammate Abanses took fifth in 19:17.4 and Strauman made a push to get in front of the Newsome phalanx to take sixth in 19:26.9. 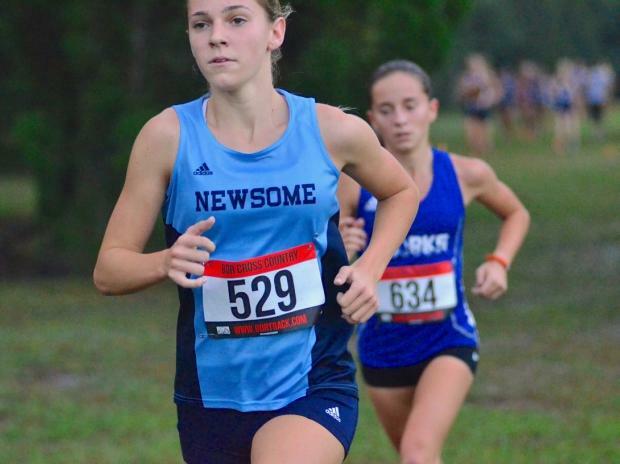 Scallon was the next Newsome finisher in seventh (19:36.9) and Plant's Grace Summers took eighth in 19:41.8. The team battle was destined to be a hot one with the likes of Citrus Park Christian and Newsome, two of the top ranked teams in their respective classifications, CP Christian in Class A and Newsome in 4A. 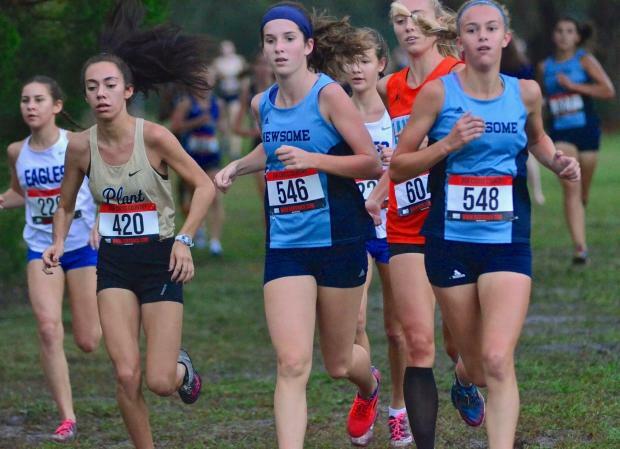 Solis was the next to finish for Newsome in 10th but then CP Christian's Brooke Santiesteban grabbed 12th. 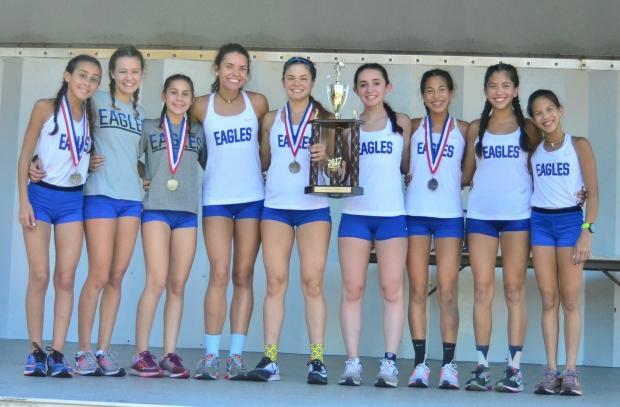 When sophomore Jensen Mayer and eighth-grader Moriah Friedman came in at 19th and 20th, respectively, the Eagles swept the title away from the Wolves 59-72. "They (Newsome) have those three giants up in front," Eagle coach Ray Friedman said. "It was not easy and we did not take this race lightly but we focused on group racing and team-ship and we were able to pull it off." Wharton girls took third with 117 and Plant was a close fourth at 124. Wharton's hold for third place was notable as they took third a year ago at the county meet but graduated their top two runners. Plant climbed up from fifth in 2016. The boys race did not have the intrigue of the girls races, at least not for the titles but there were some movers and shakers down the line a bit. In fact, the top three boys at the one-mile mark wound up the top three places at the finish line. Citrus Park Christian's Trevor Foley was able to bounce back from an illness that forced him out of the FSU Pre-State meet. "This was my first race back since then (Pre-State), it felt good, I wanted to get the lead and sit out in front," Foley said. "I'm still kind of sick but today felt good." Foley won comfortably with a 16:05.60. Running second nearly the whole way was Wharton's Nehemiah Rivers. Rivers, now a junior, moved up from fourth at last year's county meet (16:22.5) to second on Monday at 16:10.4. 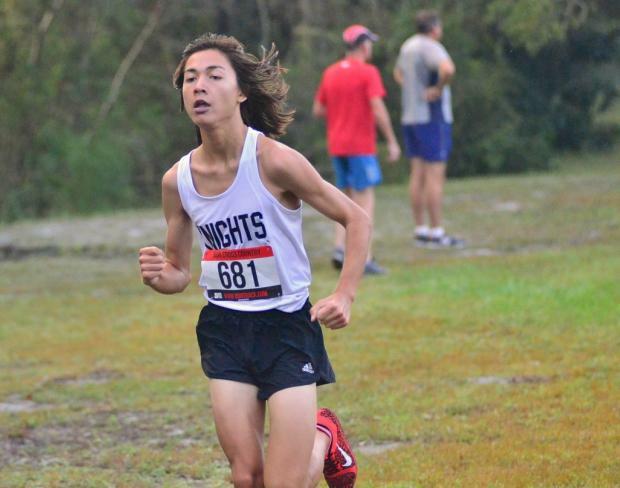 It sets a new PR for Rivers, who had previously not topped his 16:16 from 2016 states but came very close at FSU this year (16:19). Rivers now has the second-best mark in his school's history and he's chasing the 15:55 that is the current school record. "15:55 is the next barrier we hope he (Rivers) breaks through, he's just a hair off pace for that," Wharton boys coach Kyle LoJacono said. "This was also our best top five average for the season by almost 12 seconds." Robinson's Ethan Geiger held the third-place spot for virtually the entire race and finished in that spot at 16:15.8 for a new PR. 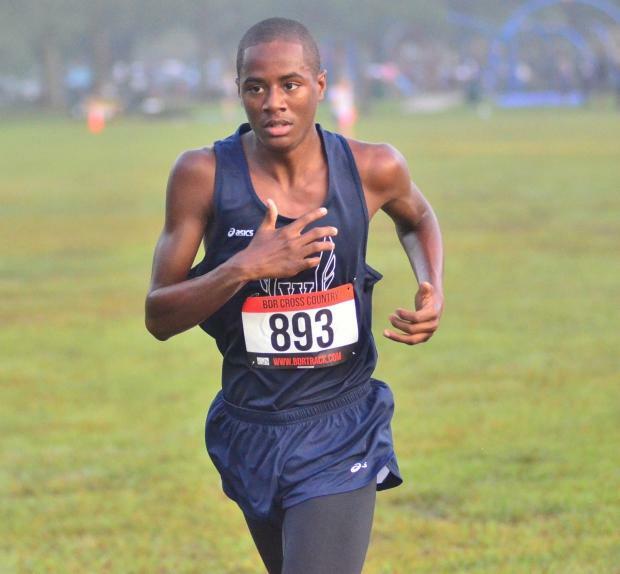 The 16:15 was not too far off his 16:24 from FSU Pre-State. Geiger gave Rivers a run late in the race but settled for third. "I passed him (Rivers) near the two-mile mark but I didn't stay up there too long," Geiger said. "I liked this course layout, you had an idea where each mile was instead of assuming what the next half was going to be like." John Robbins of Jesuit took fourth at 16:20.8 and Armwood's Jake Turner took fifth at 16:27.60. It was beyond the top five finishers where the team battle developed. 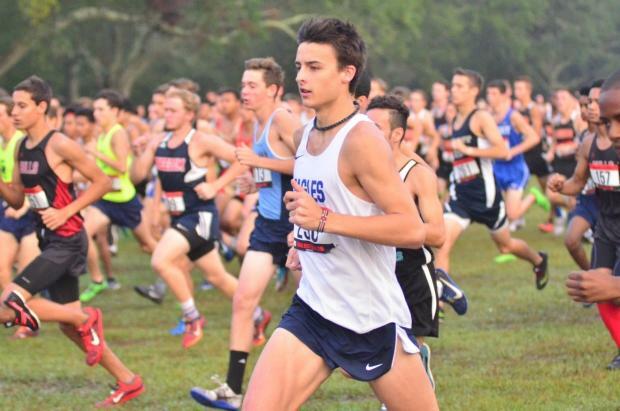 Senior Chris Pinedo led the Newsome Wolves after Alex Bugielski led the Wolves to victory at the Land O' Lakes Gator Invite. Pinedo was sixth in 16:32.7. Bugielski would take ninth at 16:51.3 and Dominic Acosta was 11th at 16:53.5. Newsome's top three performed admirably but if it was going to be a pack that won the boys title, it would be the Steinbrenner boys that packed it up. McCrea Weller had a huge race, turning out a PR in 16:51.30 and inserting himself in front of Acosta. 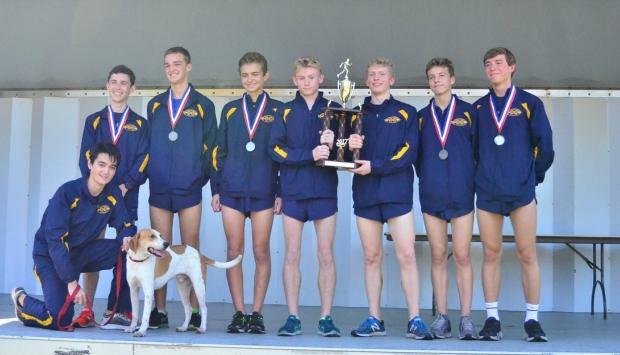 That time is way in front of Weller's 17:46 from the 2016 county meet. The Warriors packed in around him. Zach Whitmer, Davis Bly and Nick Sowell turned in 13th, 14th and 15th place finishes, respectively, all within four seconds of each other. Ryan Gorman rounded out the top five for the Warriors at 17:16.10 in 19th place. It was enough to push the Warriors past the Wolves 65-85. "We're real happy with the result, it's a great group that all trains together, all finish close together, we're not necessarily even telling them to finish that way, it's just they're all about the same ability," Steinbrenner boys coach Bobby McConnell said. 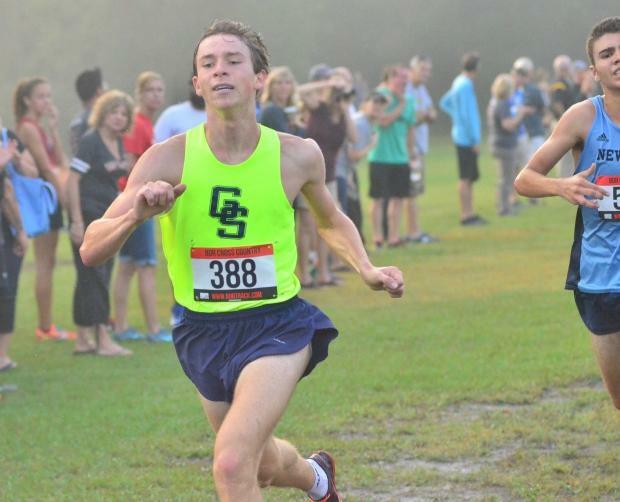 The Steinbrenner boys have been great this season, posting wins at Lecanto and at North Port where their top seven runners were all within 19 seconds of each other. They finished fourth in the elite division at FSU Pre-State as well. They repeated as team champs and even stretched their two-point margin over Newsome from 2016 into a 20-point win in 2017. Plant, led by senior Walker Thomas (seventh at 16:43.1) was third with 98.